Royal Bank of Canada (RBC), the largest bank in Canada, has established itself as the 13th biggest in bank in the world. Having served up to 16 million clients across a diversity of businesses in 40 different countries, RBC pride themselves with values such as integrity and accountability which enables them to remain the first choice of their clients. 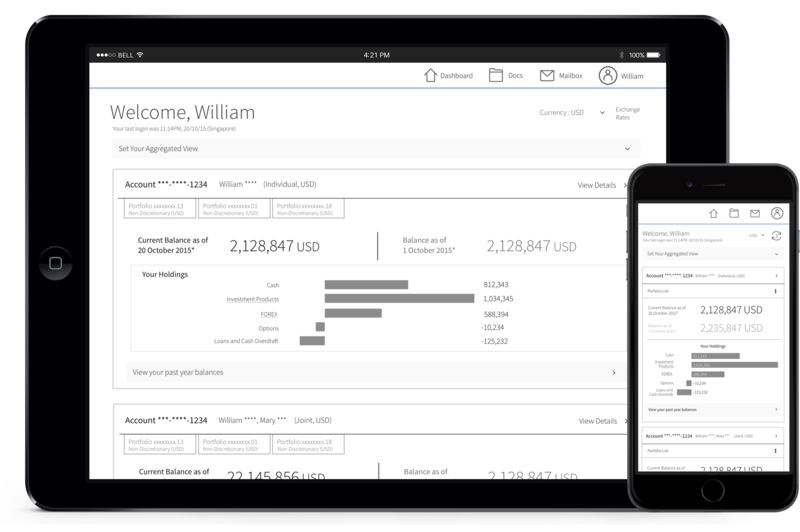 To further serve their private banking clients better, RBC has approached UXStudio to design their client online portal for the Asia Pacific Region. It would be an online experience boasting a seamless on boarding with secure access for all their clients. The portal would be a one-stop platform for clients to review all accounts held with RBC, while navigating through different portfolios with ease. They would also be able to review online statements and communicate with their Relationship Managers through the platform. With that in mind, our first step was to look into the profiling personas of the clientele in RBC, as well as investigating into the competitive landscape by trend research. The personas cover the two distinct customer variants, which allows us to identity patterns with each of them. This data would be important in defining the extent of the designed experience, hence affecting the design decisions with respect to the user behaviours. Entrepreneur. Self Driven, Self Decided. He needs convenience and needs to be constantly updated. Company Stakeholder. Multiple account holder. He has no time so needs RBC to keep him updated. After identifying the customer personas, we moved on to the trend research to source out the current competitors on the market, looking at the design features as well as possible layout opportunities that can be explored in the project. Nimble design, early customer validation and collaborative design were key to our design process. We focused on a collaborative design approach, constantly involving RBC in every step of the design, to identify issues and create apt solutions. This not only helps us obtain the client’s validation of the design between updates, but also keep everyone on the team up to speed with the most current design solutions. This also ensures accurate feedback so that the team wastes no time in sculpting the product. As the project was slated to release in multiple platforms, we had a make sure that the design works across all platforms - to create a responsive design. We made sure that the layout would look presentable on a desktop’s viewing size, yet at the same time remain functional when it is shrunk down into the mobile size. While considering the functionality on the mobile aspect, consistency in the design had to be maintained across all platforms. The is to ensure that the learning curve is minimised when users transit from one platform to the other. RBC wanted a platform where they could have an overview of all their wealth assets at once. Given that a customer may hold multiple accounts and portfolios at once, they may be overwhelmed with information on the dashboard. To ensure convenience but not at the expense of readability and simplicity, only the most critical information needed to know about the customer’s wealth assets are displayed on the dashboard.